Residing in Chandler, Arizona, Shy Witness™ is my personal blog, and all opinions expressed in this blog are mine alone. I tend to blog infrequently as I work full time, am responsible for three dogs, and am trying to enjoy life after completing a second master’s degree. As you can see from my archives, my posts tend to be on many different subjects; some are related to current events while others are personal in nature or focused on topics that apply to a wide audience. I always welcome comments and feedback. 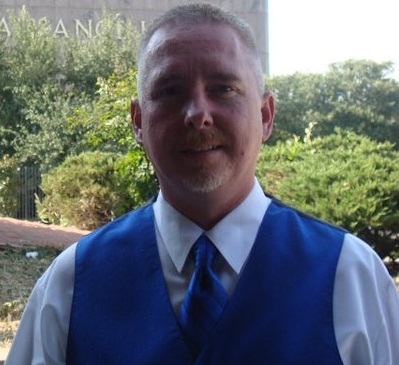 I moved to Arizona in 1997 having previously lived in Albuquerque, New Mexico. Although my original plan was to move back to New Mexico after a few years, I unexpectedly put down roots and made the Phoenix metro area my home. Apart from my mom, the most important female in my life is my dog Sandy. She was originally a rescue but was unhappy in her first home, so I like to think that I re-rescued her and brought her to her forever home. She is a Yellow Labrador/Golden Retriever mix and has an adorable under bite; each time I catch a glimpse of it I fall madly in love with her all over again. 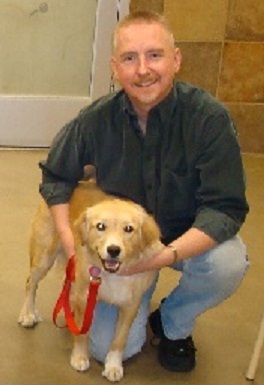 This is me and my dog Sandy after we graduated Intermediate Puppy Training at PetSmart. As you can tell from our smiles, we were both very proud of our achievement. While volunteering with the Arizona Poodle Rescue during 2016, my foster #3 was a male Standard Poodle named Ricky. A couple of weeks into his fostering period, I adopted him and he became my foster failure #1. He used to gravitate to the couch in the family room for some reason. He was very friendly but was obviously malnourished and in need of love and attention. Over a year later, he is a completely different dog in that he has put on weight and no longer wants to crash on the couch all day. His heart is still as big as ever and he loves any attention shown to him. If you have never considered fostering a dog, or even adopting one, take a moment and think about it. It’s not a task you should undertake lightly, but you will never regret it.